Israeli soldiers killed, on Tuesday morning, a young Palestinian man near the junction of Ariel illegal colony, north of Salfit, in northwestern West Bank. The army initially claimed the Palestinian reportedly “attempted to ram soldiers and settlers with his car,” but later revealed that the driver was driving a stolen car, and escaping from private security guards. Israeli daily Haaretz said the Palestinian the driving a stolen car, and that he was chased by a private security company. It added that the Israeli police was not involved in the chase, and that it remains unclear whether the soldier, who shot and killed the driver, was aware of the chase. The driver did not carry any weapons, and did not intend to ram the soldiers, or carry out any sort of attack. 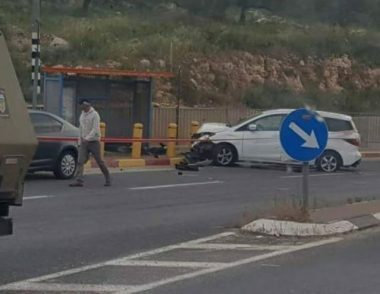 The soldiers opened fire at the Palestinian driver, in his thirties, and seriously wounded him, when his car crashed into a bus stop. Haaretz said the Palestinian was driving a car with an Israeli license plate and added that the army was trying to identify him. It also said that the driver exited the car, and tried to escape on foot, when the soldiers shot him, and he later died from his serious wounds. The Maan News Agency said, according to Israeli sources, the man might have been driving a stolen car, and tried to avoid escape when he saw the soldiers. The army did not report any injuries among the soldiers or the colonialist settlers but said that the Palestinian was driving very fast when he approached the bus stop. It added that it was still investigating the incident.